Email timing can have a massive impact on an email programs success. While gaining inbox placement is becoming increasingly difficult, there’s an opportunity for marketers who are willing to learn and implement new strategies to better serve customers needs. In this post, we’ll explore three ways marketers can use timing to their advantage to get better inbox placement and better results from their email marketing efforts. Emails are time sensitive. In the first hour after delivery, an email has a 23% chance of being opened, that drops to less than 10% in the second hour and by hour 24, an email has less than a 1% chance of being opened. This is why your email timing is so important. Timing your email’s to land when your users are on their computer and ready to engage can be a huge advantage. So what is the best time to send email? Countless surveys and studies have been conducted on the topic, but the peak times vary a great deal because the engagement patterns of individuals making up each list are different. The top send time for your organizations’ list is going to be different than other organizations because your list of contacts is unique. Most studies show weekday mornings have the highest engagement metrics but for certain industries like restaurants or hospitality, weekends and evening are better. In addition, the top time for open rates may not be the same time as the top time for conversions. So what’s the solution? Email timing personalization takes the guessing out of the equation and crunches the numbers from all your stored email data to deliver each email to each person at their top time. If personalization is not an option, the next best thing is to A/B test the timing of your email blasts until you can hone in on the top time for your audience. How fast: Slow down your delivery rate. One of the most surprising outcomes of our research at Seventh Sense has been that simply randomizing and spreading out the delivery of email marketing mailings outperforms “blasting” all the messages at the top delivery time for the list using list level send time optimization. 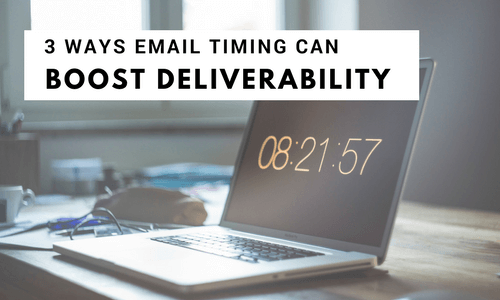 We believe the primary reason for this increase in deliverability is due to email service providers being more likely to flag bulk email deliveries as spam. ISP’s may throttle large deliveries and some private institutional email servers may even have limits on the amount of email that can be accepted in a given amount of time from a single IP address. This can create major deliverability issues — especially when BOTH sales and marketing teams are targeting a large account in an ABM effort. If you are using good list building practices, everyone on your list was at some point interested in your organization, but circumstances change. Sometimes the line between a person looking forward to emails from a brand, vs getting turned off to the brand, comes down to how often they receive messages. The most common reasons people give for unsubscribing from email lists have to do with the volume of emails being too high and the content becoming uninteresting. The problem for marketers is that for the most interested customers, not sending enough email can lead to lost sales revenue, but over sending to uninterested subscribers leads to low open rates, spam complaints, lowered sender score and eventually lower deliverability. Sending a higher volume of email to your whole list may result in a small bump in traffic or sales in the short term, but over mailing will lead to a lower overall ROI from email over time. Take the time to segment your list, by interest, by behavior, and at a minimum by last engagement. Tools like Seventh Sense automate the process, but engagement based segmentation can be done manually as well. If a customer hasn’t opened your emails in 5 months but has consistently opened your end of year sale email, or end of year donation campaign, you don’t need to completely scrub them from your list. Segment them into your low engagement category and send them only your top performing emails.